Not particularly pretty cooking, but tasty none the less this month. I’ve been playing with a few new ingredients lately which is always good. Also trying to jazz up a few of the regulars as well. 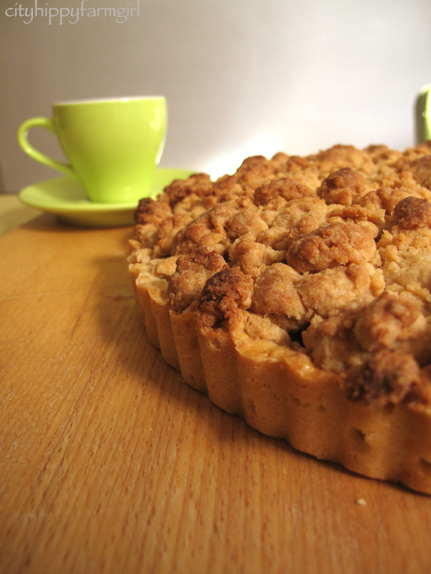 The ever reliable apple crumble with a pastry base to give it a bit of a twinkle. Lemon zest in the pastry, raw sugar and a pinch of coriander cooked in with the apple and a dash of vanilla in with the crumble topping. Chinese Cabbage is getting a look in. This is a variation of my standard winter salad. 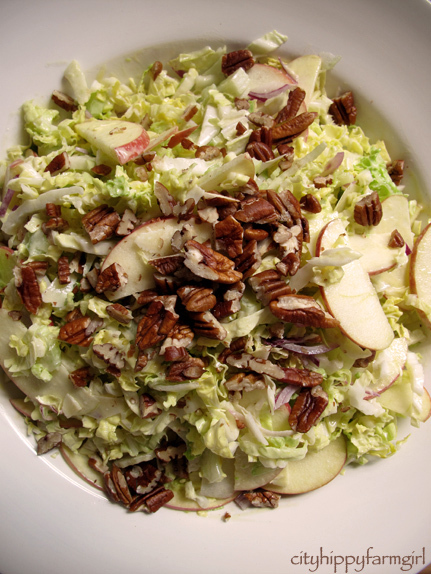 Chinese cabbage, pecans or walnuts, apple and what ever else is looking good at the time. Lemons are plentiful at the moment. Whispering words such as pie…pie…pie to me. It doesn’t matter what kind of pie. As long as it involves lemons and pastry somewhere within. 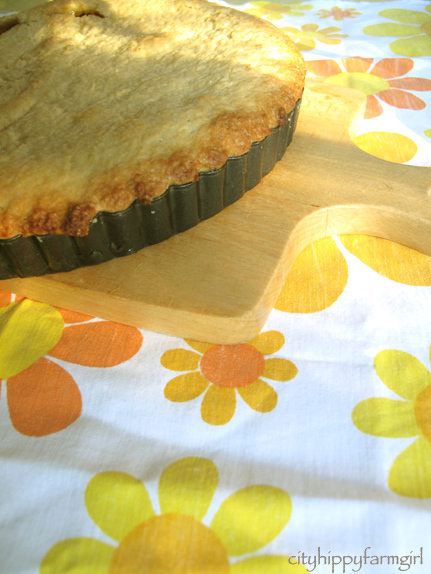 This particular pie had potato flour in it as a thickening agent. Different for me, and I have to say… I quite liked it. 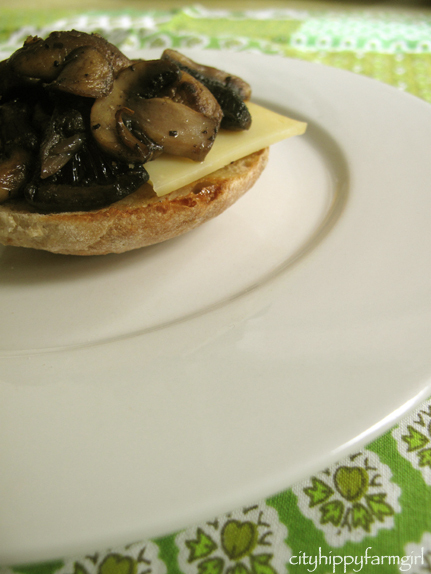 Swiss brown mushrooms, on swiss cheese, on sourdough. My favourite lunch at the moment. Not Mr Chocolate’s favourite lunch, although he does assure me he loves mushrooms. Loves them so much he only wants one or two a month. I’m not sure it’s quite the same love we have for them. High hopes and grand plans little fella. You live and you learn and all that. Next time, I’ll either buy a bigger one, or use it a lot quicker than which I did. Delicious yes, but I think some of its oomph was lost in between the buying and eating time. Still tasty though, eaten with some wilted greens, scrambled eggs, sourdough, and a side of Mr Chocolate’s favourite mushrooms. Then again with a little softly cooked egg and shallots. The third egg I cooked was the best, (unfortunately not the one pictured.) The subtlety of the softly cooked egg with the generously grated truffle was quite delicious. So what else is in season round these parts in the winter months? rhubarb– I’m just waiting for the right bunch to come along and a rhubarb extravaganza is planned….but it has to be the right bunch. What seasonal cooking are you doing at the moment? This entry was posted in Connecting with Community, Food Glorious Food and tagged apple, cabbage, eggs, lemon pie, mushrooms, nuts, seasonal, slow food, sydney, truffles, winter salad by cityhippyfarmgirl. Bookmark the permalink. That is hilarious 🙂 How does a dog manage to spit out whole mushrooms anyway?? I have no idea, great determination I suppose! Easy peasy winter salad. I think I’ve been doing variations of that for the last 2 years now. Great post. I forgot to buy mushrooms from the market yesterday, actually, my favourite mushroom stall wasn’t there, but we always like to have a few mushrooms in the fridge. Lemons too, I am lost without lemons in my kitchen. Working my way through a box of blood oranges, just used them in an Asian caramel sauce for my pork belly. Ohh Lizzy, a whole box of blood oranges- how wonderful! What did the truffle taste like?? like warm winter sun on your back Kim. Those mushrooms look wonderful. The salad looks divine too. Is it possible to make vegan pastry? Have you ever done it? Also your photos of Hobart look lovely. I want to hear more about your trip! Hmm, vegan pastry I am waaay out of my depths with that one. I’ve never tried as butter and I are firm friends. As for Hobart? You would love it down there Nic. I’m drawn to the Swiss mushrooms on sourdough, myself. Might have to do that for lunch today. It’s a winner Misky. Simplicity at its best. That mushroom love of his still makes me chuckle. As for the coriander, just a pinch (dried that is) through the cooked apple. Oh mushrooms on sourdough – thanks B – I picked up some lovely organic mushrooms at the market on Saturday and I will fry these up on rye for breakfast tomorrow! The chinese cabbage in the salad – is it raw? Seasonal cooking here is lots of veggies- zucchini, peppers, tomatoes, corn on the cob,eggplant, fresh onions- I love the variety in summer- love walking out to the garden and deciding on the menu depending on what is ripe. You’ve been very busy and I’m thinking I would like your winter season . Looks pretty to me. Pretty darn tasty! Brydie your cooking looks good, especially at this stage of winter. Don’t forget strawberries: there are some stunners in the greengrocers’ at the moment with an amazing scent. Last year they were superb. Alison I tried for ages to find a good angle. It just wasnt working for me…tricky! Oh wow. Everything looks so amazing. 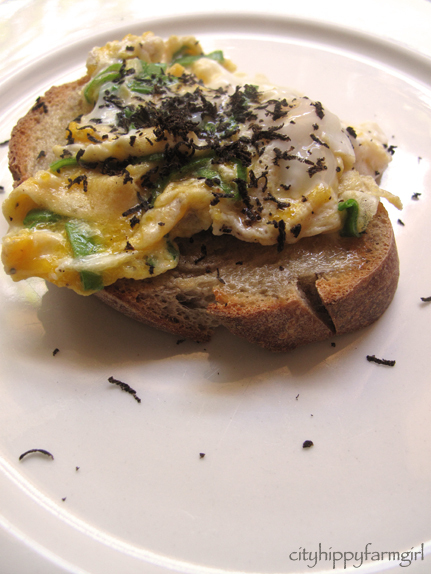 Esp love the last pics with eggs on toast and shaved truffled. OMG, nearly licked the computer screen when i saw that. haha…it’s too bad there isn’t a lick and taste app for food posts. Celia you are so right, I think it is about capturing that truffle magic. Enhancing it’s flavours by letting it be the star, and not competing in anyway. I’m definitely curious to play with more though…. could be an expensive habit! Pastry makes everything extra delicious! Your comment on the mushroom love made me laugh! Truffleness..haven’t gone there and not quite sure what i’d do if I found myself there..you knew exactly what to do with your treasure, clever thing. I love it that you have small one at the hip, can go away for a conference and still be in a regular sourdough baking rhythm when I can barely rustle two crusts together. Hey..just a thought…sourdough rusks for the little one? yep, I think there will definitely have to be some sourdough rusks happening. Those poor teething gums could use something to gnaw on. Oh all of that food sounds amazing, lemon yes, good with everything. We’re eating broccoli and have recently discovered the leaves are pretty tasty, had with bok choy and carrots in last nights stir fry. Oh Kirsty I never use the leaves… stalks yes, silly girl, will remedy that- thank you. Love that little truffle! And suddenly I am very hungry. lovely post as usual brydie with your delicious seasonal dishes..i must remember your apple crumble with the pastry base for my daughter alex..she loves apple crumble..